Many photographers feel that while their digital cameras produce amazing quality images when used correctly but believe the craft of the media has been taken from them and embedded in software applications. The darkroom is still a place where the true craft of photography can be found. Darkroom equipment which was once priced beyond the means of the typical enthusiast photographer can be picked up in online auctions for a tiny fraction of its original value. Sadly, courses on the subject are slowly disappearing as colleges convert their darkrooms into digital editing suites. Traditional black and white photographic prints still have some significant advantages over their digital equivalents the most obvious being its archival quality. A properly processed and washed black and white print on fibre based photographic paper should still be around in a hundred years time. The digital equivalent would need regular conversion by the photographer and their progeny to be available for future generations. 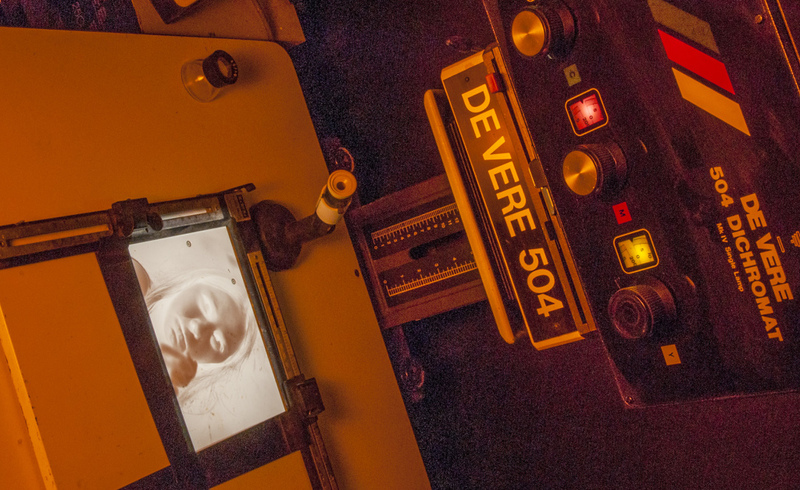 My darkroom is just outside of Bath, it houses two enlargers, a Devere 504 covering a range of film formats including; 35mm, 6cm x 6cm, 6cm x 7cm, and 5″x4″ and an LPL C7700 enlarger for 35mm up to 6cmx7cm. Classes are limited to a maximum of two attendees. Typical workshop content might include; an introduction to darkroom equipment, film processing demonstration, contact printing, enlargement, use of multigrade paper, dodging and burning and split grade printing. If you would prefer to have the workshop at your home or workplace I also have a portable darkroom which can hold between three people including myself. If you would like me to deliver the course at your home or workplace give me a call or drop me an email. I have taught both digital and film photography for over twenty years and have worked as a commercial photographer for nearly thirty. While all of my commercial work is now digital I am still passionate about traditional photography. My training courses can be combined into a three day workshop covering fundamentals of photography including pinhole cameras and darkroom work. Photographic lighting including flash, incandescent and fluorescent and digital image editing using Adobe Photoshop and Adobe Lightroom. Please contact me if you would like to know more about combined analogue and digital course.